Advertising a product is not a one day job, it is about a matter of days, weeks, months and also for a year of constant struggle. When a business owner invests on his product’s advertisement, it really pays off as he can reach out to a maximum amount of people through advertisements and people develop a sense of understanding as well as recognition for the product or even for a brand. It takes a lot of thoughts and ideas that how the media campaign can be run. Perhaps it may cost mighty that one cannot afford in the very beginning. It also depends on the team efforts and the designers who carry this advertising operation out. However there are other more feasible methods and channels to start off advertisements in the corporate world. Billboards, building banners and hoardings are the proper and noticeable ways to make the advertisement come under the spotlight. Small/big wooden/steel stands out of the shop also do a great business, as long as they are built with finesse and innovation. Down here I am putting forward a free outdoor advertising a-stand mockup that can be placed outside the shop, so the people passing by can look at it and get to know what shop it is all about, what things are being served in there and it also serves as a (store locator stand); this is not just all, it can be used as for an announcement of a new product, new arrivals at showroom, new range of stuff, amazing deals, sales/discounts, new additions, price lists/rates etc. 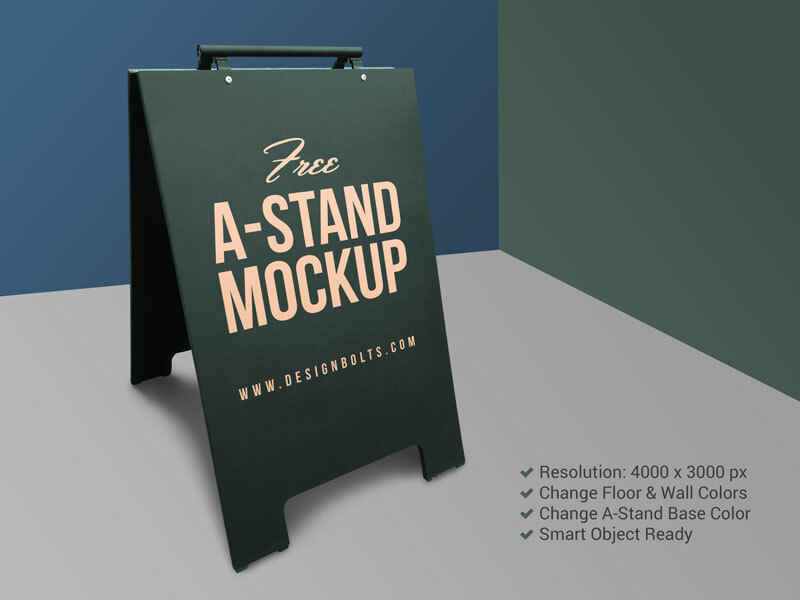 One should make sure that the a-stand out of the shop is attractive, vivid having readable fonts and a finer background. Too much of colors and textures become sometimes superlative and not appreciative so make it as simple as possible but truly unique and one of its kind stand so people don’t ignore it by any chance. For more amazing freebies, tech gadgets/devices, design shootouts, artist of the month, WordPress themes and other geek stuff; stay cling to us. We love to hear from you and we try our best to bring out the amazing, interesting and inspiring stuff for you all. Here we go.